Blue sapphire sterling silver ring inlaid with lapis and opal. Kingman spiderweb turquoise wedding ring set handmade in sterling silver by Hileman Silver Jewelry. The man's wedding ring is masterfully inlaid with 7 pieces of beautiful spiderweb turquoise from Kingman, Arizona. The spiderweb turquoise is blue and has a tight black spider web matrix. This ring is about 6mm wide at the top with a slight taper toward the shank (bottom). The woman's wedding ring is 4.5mm wide at the top with a slight taper toward the bottom. It is a scaled down version of the man's band and is inlaid with Kingman spiderweb turquoise to match his wedding ring. Both rings are hand signed "MMH" by Mark McBride Hileman on the inside and stamped .925 sterling silver. It will take 4 to 6 weeks to create this beautiful handmade turquoise wedding set in your exact ring sizes. This ring set is also available in 14k gold, stainless steel and cobalt chrome for an additional cost. Other inlay materials are available as well. 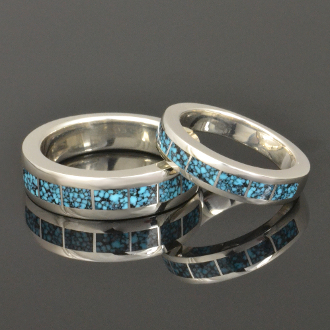 These rings may be purchased separately or as a his/his or hers/hers ring set. Contact me for details. Please take a look at our shop policies and information page before ordering! It is very important that you give us your correct size when ordering as it is difficult to adjust the size without using a laser welder and risking damage to the ring. The paper finger sizers you might find on the internet and print out are not accurate so please do not use them. We have experimented and found that they vary from a 1/4 size to a full size in error. Please visit a local jeweler (or two) and get your finger sized properly. We depend on you, the customer, to provide us with the correct size so please do not estimate or guess. Special order size rings are NOT RETURNABLE.